The Dutch see their bikes as a natural extension of themselves. It is their primary means of transport. Without it, you are nothing! Whenever I go to visit the World show, I never lose that childlike wonder, the anticipation, and the chance to view the Top Breeders’ birds. I arrived at the show early Friday morning before the crowds so I had the opportunity to view the Lizards without interruption. On entering the show venue, the glitz and glamour of previous World Shows was missing. The Show had a very reserved, grey cloud like feel. I am sure this was due to the relaxed nature of the Dutch; nonetheless, I did enjoy this approach as it allowed me more time to relax. Spectacular seating areas within the show hall allowed breeders to become acquainted with friends they perhaps had not seen for some time. Lighting across all staging was another great improvement. However, I was deeply disappointed to find the aisle staging the Lizards, the most fascinating canary with the most important show features, without lighting! They deserved better! As always, when visiting World Shows, I have to hand a Catalogue of the exhibitors’ birds. I look at the birds placed 1st, 2nd and 3rd then compare these to all the birds within each respective class making brief notes of each subject. On the following day, I normally view all of the Lizards 3 or 4 times throughout the day. Noting and re-evaluating the changes that develop at different stages and in particular if a bird retains its status. Unfortunately, it became very apparent to me that the importance of judging the Lizard had been lost. During my personal judging engagements, planning is key. Expect the unexpected, do not compromise on your deliberations. Never judge the ring, judge the bird! In my opinion, the judgements were very erratic based on the ID ring rather than the quality of the subjects. When you hear a Lizard has reached the heady heights of 95 points, as a judge/breeder, you are anxious to see how good the subject is in comparison to its placed counterparts. You think to yourself that they must be exceptional. Seven judges, 5 from the Netherlands, 1 from Portugal and 1 from Italy, whom it seemed popped by to judge 8 birds – has the standard of judging deteriorated and now requires multiple attempts? Surely, it is not difficult to appoint two judges, or better still one that has knowledge of a good Lizard… it is the World Show after all. You come to accept there will be an element of place selection from the judges of the host Country, admittedly some of the winning birds did possess outstanding spangles, but if we are to judge on spangles alone what is the justification in promoting the standard? Even more so on a points system; how can two birds in the same class differ dramatically in points when only one has the desired qualities, yet it is the poorer bird that is awarded a medal? Outstanding spangles yes but also fundamental flaws! It was discouraging to see a lack of pronounced rowings, disappointing that a mass of black across the breast now constitutes quality, and that light white patchiness seemed to be accepted as normal between the legs. Poor ground colour of a dull olive was apparent in both silver/gold, and yellow patches that breeders seemed to believe were an enhancement of the birds colour rather than a flaw were visible across many subjects. The flaws continued with birds that had no substance or size with tram-lined rowings, birds showing no clarity with quiffs and the abnormal ^ shape within the throat were prevalent, which only accentuated the flaw. These faults are becoming all too common we need selective breeding now before it becomes the accepted standard! Dark spangles with defined crescent edging. Even bronze ground colour with no olive brassiness. Precise black feather in the wing coverts. Straight-piped tail edged in bronze lacings. Cap oval shaped just slightly long. Rowing is bold with clarity of edging across the breast with no thinning towards the centre running between the legs on past the vent with no white/yellow or patchiness. How is it possible that such a bird can be awarded only 89 points, when an inferior bird was rewarded highly? I do hope that the pictures provided will assist in qualifying my deliberations. My thanks to Joe for his report and the multitude of photographs which will enable readers to draw their own conclusions. There are so many photos that I have published some in the gallery below and the remainder will be posted in a few days time. They are presented in random order but will illustrate the huge range in quality of the birds on display. As always with the gallery, click on a photo to see a larger image. and again on ‘view full size’ for yet a larger version. It is possible that this bird may not have displayed her best qualities when she was up in front of the judge. Lizards can change a lot in a short time. We are judging on points to a Standard, take away the points for spangles then judge the birds. I have attended 4 world shows over the past few years and at best the judging has been questionable. As Huw correctly states above, Lizards are renowned for changing during their time at show and that is something as a Lizard Judge we have to accept. Joe is spot on with his deliberations and the faults highlighted have been the topic of conversation between us and other credible Lizard Judges many times over the past few years and the faults are on the increase. Breeders and judges must learn that a mass of black feathers on the chest or straight lines are NOT what is required with Rowing’s and the craze for black legs yet the beak is clear/pale….not as desired and should be penalised heavily. 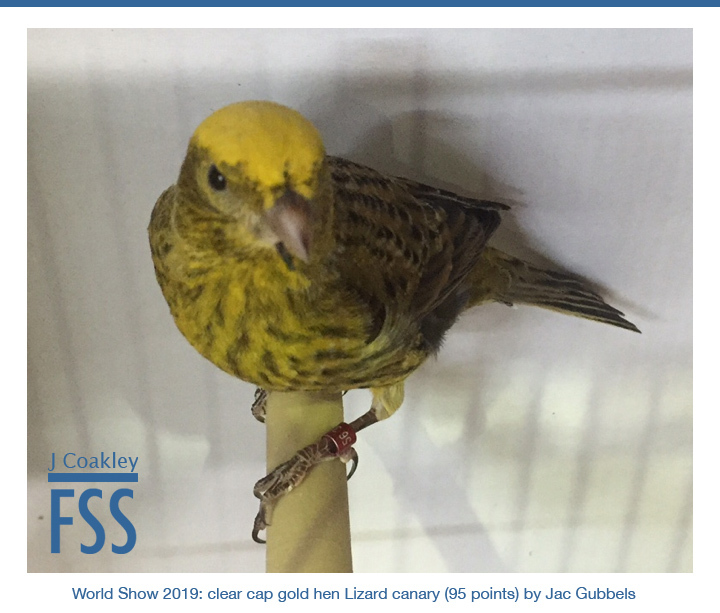 until the world show is judged by Lizard judges with strong knowledge and dedication to improve the breed (COM seem to have very few) the downward trend will sadly continue. I am not sure that the ‘downward trend’ in the quality and increase in faults can be laid at the judges door. True that if judges do not have the specialist breed knowledge then they may not be able to make the correct determination against the standard that drives improvement. However one has to wonder where the preponderance of the faults emanate from – if as seems to be suggested they are on the increase. Ian ;- the faults emanate from breeders pairing birds together incorrectly and not understanding the required standard. Judges are to blame for not penalising faults hard enough and again not understanding the correct standard required. only us as breeders and judges are to blame….not the birds. Pour ma part j ai vu de très bons oiseaux qui méritaient bien mieux .Certes il y a eu quelques erreurs de jugement à mon sens. J ai remarqué également que les oiseaux assez forts avaient la préférence des juges. A mon sens maintenant trops de classes existent pour le Lizard le nombre d oiseau par classe est de ce fait trop faible et la qualité est moindre pour les lauréats.